Here's a wonderful pound cake you can serve at almost any occasion. It works well for a brunch, an afternoon tea, a light dessert after a heavy meal, or just slice yourself a piece and enjoy as a snack with coffee or tea. If desired, you may substitute the orange zest in the cake batter with lemon zest and use lemon juice and lemon zest in the citrus glaze. 1. Preheat oven to 350 degrees F/180 degrees C.
2. Grease and lightly flour an 8 x 4-inch loaf pan. 3. Sift flour, baking powder and salt into a bowl. Stir and set aside. 4. Mix eggs, milk, vanilla and orange zest together in another bowl. Set aside. 5. With a stand mixer fitted with paddle attachment or alternatively with an electric hand mixer, cream butter and sugar until light and fluffy. 6. To the butter mixture, add half the wet mixture and then half of the dry mixture, beating well after each addition. Scrape down the sides of the bowl. Beat in the remaining wet mixture followed by the remaining dry mixture beating until incorporated. 7. Spoon the cake batter into pan. Bake until toothpick comes out clean when inserted, about 50 to 60 minutes. 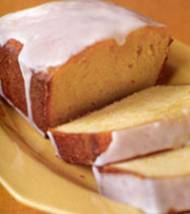 The pound cake should be golden in color and the top will be slightly cracked. 8. Cool in the pan for 10 minutes. Turn out cake from pan and transfer to a wire rack and cool completely. Brush with citrus glaze. Slice and serve with crème fraiche, whipped cream, or ice cream if desired. 1. Whisk orange juice, orange zest and confectioners' sugar together in a bowl until fully incorporated. Brush or drizzle over cooled cake.